Undertaking the most pleasant task of going through my Air Britain DC-3 monograph, I was bemused to note (Volume 1 page 253) that there appear to be some 25 American registered DC-3s that are not on the American register! As the monograph comments: "Several of the unknowns are believed to be aircraft used by the CIA (Central Intelligence Agency) or DEA (Drug Enforcement Agency) and excluded from the Register". Bemusement turned to concern when I realised I had seen one of these aircraft, N61696, and that I might never be able to ascertain its identity. Checking my notes of a trip to Florida in April 1975, there quite clearly recorded at West Palm Beach Airport, north of Fort Lauderdale, on 22nd April was DC-3 N61696. It had a white fuselage with a mauve cheatline, white tail with a mauve band, and the title AUTEC in the tail band. N61696 was also noted and reported by many other enthusiasts who visited West Palm Beach during the early 1970s and was last reported there in January 1976, with the titles removed at that stage. Accordingly, more than thirty years after the sighting, enquiries commenced to see what could be discovered as to the identity of N61696. It is of course quite impossible to carry out any research on an aircraft without its manufacturer’s serial number, or constructor’s number (c/n) as it is also known. What was its history, what became of it, no way of knowing without the all important c/n. With the internet however research was possible on some aspects, for example, what was AUTEC? A bit of ‘googling’ soon produced numerous websites which answered this question. 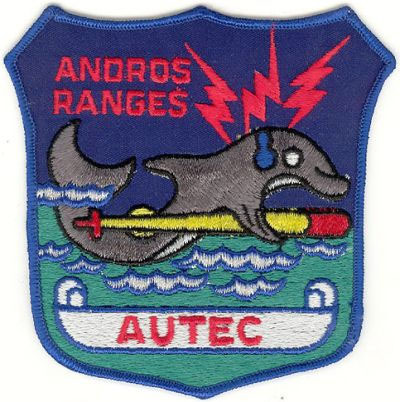 AUTEC stands for the "Atlantic Undersea Test and Evaluation Center", a US Navy facility which is "an instrumented laboratory that performs integrated three-dimensional hydrospace/aerospace trajectory measurements covering the entire spectrum of undersea simulated warfare, calibration, classification, detection and destruction. Its vital mission is to assist in establishing and maintaining naval supremacy of the United States through testing, evaluation and underwater research. This sophisticated facility includes three test ranges, all located in a deep-ocean basin approximately 100 nautical miles (190 km) long by 15 nautical miles (28 km) wide that varies in depth down to 6,000 feet and lies off the Bahamas. The main AUTEC support base and down-range tracking stations are on Andros Island in the Bahamas, 180 nautical miles (333 kms) southeast of West Palm Beach. In these test ranges, surface warships and submarines train and use their weapons, with their performance being monitored by numerous in-air and in-water tracking instruments. To operate the facility requires a large number of Naval personnel and civilian contractors and so a need arose for an air service, to fly these people and their cargo to and from the island. The base for the air service was established at West Palm Beach on Florida’s Atlantic coast. Only one website could be found which mentioned the DC-3, but it did provide some interesting background information. This was the website of International Pilot Services (www.intl-pilot.com/content) and an article by Roger Rose, supplemented by some additional information which he kindly provided when I contacted him, which gave the first indications of CIA involvement with this DC-3. As the article explains, a Mr Bob Emmons ran two companies, World Aviation Services and Imperial Aviation, based at West Palm Beach. Mr Emmons had formerly worked for Southern Air Transport and several other CIA supported airlines. World Aviation Services and Imperial Aviation were recruitment companies for pilots, specialising in F-27 and Pilatus Porters. The pilots would deliver these aircraft for oil and exploration companies to remote parts of the world, help start up their aviation operations, provide on-going training and such like. Many of the pilots had formerly flown for Air America, Continental Air Services and other such CIA companies in South East Asia. World Aviation Services ferried several Pilatus Porters to South East Asia for use by Air America during the late 1960s. Air support of the AUTEC operation started in 1966 and the contract was given to Bob Emmons. At first this was a small scale operation, with a Cherokee 6 and Twin Otter, which was most likely N389EX which was ferried by World Aviation Services from West Palm Beach to Bangkok on delivery to Air America in January 1972. In 1968 it was decided to acquire a DC-3. The recollection of Roger Rose and others involved was that this was a former US military C-47, which arrived in Miami to be refurbished. Based at the Miami International Airport at that time was a company called Air International, which had a big contract from the United States Air Force (USAF) to convert C-47s to AC-47 gunships and EC-47 electronic counter-measures aircraft for use in the Vietnam War, and large numbers of C-47s were processed through the company’s facility during the late 1960s. The World Aviation Services/Imperial Aviation C-47 for use on the AUTEC contract was flown to Miami and converted by Air International to a civilian aircraft, painted in the colour scheme already described and sporting the registration N61696 made the short flight north to West Palm Beach and entered service on the AUTEC contract, flying to Andros Island and return every day, bringing people and goods to and from the AUTEC facility. It would serve on this route for the next seven years. When in the early 1970s Imperial Aviation acquired the use of Fairchild F-27 N1004 for the AUTEC contract, the C-47 also continued in use but as a back-up to the F-27. It was used whenever the Fairchild was down for maintenance, or when there were heavy loads which required both aircraft. Roger Rose joined the company in 1973 and flew on both aircraft. He can recall often looking at the data plate in the C-47’s cockpit but, understandably after so many years, could not recall the serial number or former military tail number, Somewhat unfortunate, that! There were many memorable flights out over the azure Atlantic waters, to and from the Bahamas but the region’s many thunderstorms often provided challenging flying conditions. The F-27 was replaced in July 1972 with a Fairchild FH-227 N7801M. The C-47 was taken out of service around January 1976 and sold. Roger recalls that it only had just over 7,000 hours flying time on the airframe when it was disposed of. Another FH-227 N4226 was leased by Imperial Aviation for a time, and in November 1987, yet another FH-227 N4716Z joined the Imperial Aviation fleet. World Aviation Services/Imperial Aviation continued with this work until they lost the contract in 1992 and the two FH-227s N7801M and N4716Z were sold. The contract was taken over by AUTEC Aviation Services, the Flight Department of Range Systems Engineering, a Raytheon company, who have operated these services ever since with a pair of Beech 1900Ds, N45AR and N46AR. The company also flies two Sikorsky S-61Ns helicopters N138AR and N232AC. As its page on the AUTEC website (www.npt.nuwc.navy.mil/autec/as.htm) explains: "AUTEC Air Services provides both fixed and rotary-winged aircraft to support range logistics and test operations. Fixed-wing aircraft are available for transporting personnel and equipment between the AUTEC detachments, West Palm Beach, Florida and Andros Island, Bahamas. Cargo flights can be arranged as needed. Helicopters are equipped to provide mobile target launch and torpedo recovery services on the AUTEC range. These helicopters are available to act as airborne targets for tracking systems tests and calibration, and for range surveillance, photographic and other test and training related missions". Whatever about the diplomatic and military imperatives of putting bogus registration marks on aircraft which were to be operated in the war zones of South East Asia, as the CIA were given to doing, there surely could have been no such justification for treating like this an aircraft which was to operate out of sunny Florida, carrying civilian contractor personnel, and surely this C-47 must have had a valid FAA registration..? A Freedom of Information Act (FOIA) request to the FAA, which was dealt with most efficiently and expeditiously, confirmed that this C-47 was indeed validly registered as N61696, even though this information was not made public at the time. Using the information provided by the FAA, the story of this C-47 can now be told. Alas, it is not the full story as much of its activities remain shrouded in secrecy, but it is an interesting tale nonetheless. Douglas C-47 N61696 is now identified as c/n 25509, first delivered to the USAAF as 43-48248 in July 1944. The DC-3 monograph gives its military history. It was assigned to the 9th Air Force in Europe and in the years that followed was based at various locations in Germany. In March 1951 it was assigned to a "Secret Project", the first of many clandestine activities of its long career. In May 1966 it joined the 7206th Combat Support Group based at the USAF Air Base at Athens, Greece and according to the monograph it continued serving with this unit until 9th May 1968. Other sources also quote the ending of its military service as the 9th May 1968 when it was, according to its USAF record card, “transferred to another agency". In fact, according to the FAA file, it had already left the USAF’s service a few months before that date and the documents on the FAA file disclose the following. By Bill of Sale dated 5th January 1968 the Government of the United States, acting by its General Services Administration, transferred ownership of 43-48248 to a company called Southern Sky Inc of Dallas, Texas who registered the aircraft as N61696 and who by Bill of Sale dated 3rd May 1968 transferred ownership of N61696 to Aviation & Inland Marine Rentals Inc of Denver, Colorado who on the same day applied to the FAA to become the registered owners. Both of these companies were connected with the CIA. Southern Sky Inc supplied Beech C-45s to Air America for use in South East Asia and received some Hughes 500s from Air America when they were finished with them. Aviation & Inland Marine Rentals Inc supplied Twin Otters to Air America which were used in South East Asia. During this period, the first few months of 1968, the C-47 had evidently been flown from Athens to Miami where it was being refurbished and civilianised as already described. Aviation & Inland Marine Rentals Inc were evidently connected with Bob Emmons and his companies as even though there was never any formal transfer of ownership, on 3rd June 1968 World Aviation Services Inc applied to the FAA for a Certificate of Airworthiness for N61696, claiming to be the owners of the aircraft, and this Certificate was granted. Interestingly, the application discloses that N61696 had a total of 5,459 flying hours on the airframe at that date, quite a low time flying time for a C-47. N61696 then started flying for World Aviation Services/Imperial Aviation on the AUTEC contract, based out of West Palm Beach, Florida as already described. This use of the aircraft continued until January 1976 when the C-47 was noted at West Palm Beach with titles removed. In April 1976 World Aviation Services applied to the FAA to re-register the aircraft as N6169H, but that did not proceed. Instead, on 4th August 1976 the aircraft was transferred back to Aviation & Inland Marine Rentals Inc of Denver and re-registered as N68071. It is at this stage that the C-47 disappears from view again and for the next 16 years there is no reported sighting of it, no inclusion of the aircraft in any published fleet list! Its registered owners during this period can be seen from the FAA file, and are as follows. It remained registered to Aviation & Inland Marine Rentals Inc as N68071 until 4th October 1982 when it was transferred to Benton Smith & Co of Houston, Texas, still registered as N68071. By Bill of Sale dated 20th January 1983 it was sold on to Tony Taylor, trading as Taylor Avtech of Phoenix, Arizona who re-registered the aircraft as N21669 on 25th January 1983. It would continue to be registered to Taylor Avtech until May 1992. Accordingly, for the period from August 1976 to December 1991, although the registered owners of this C-47 are known, nothing is known of what it was doing for this 16 year period nor where it was doing it! The next development occurred in December 1991 when N21669 arrived at Oshkosh, Wisconsin for conversion to a Basler BT-67 turbine. The work was carried out between December 1991 and April 1992 and as well as converting the aircraft as a turbine, it was also equipped with communications and navigation equipment to an extremely high specification. It received a state-of-the-art multi-sensor area navigation system, a very advanced radar, HF/VHF/UHF radios and satcom. It was painted all white with a thin red cheatline and no titles. All this work was done for its new owner and by Bill of Sale dated 8th May 1992 Taylor Avtech transferred ownership of the aircraft to Stevens Express Leasing Inc, then of Washington, DC (later of Cordova, Tennessee) who were registered as owners of N21669 on 10th July 1992 and who re-registered the aircraft as N5156T on 10th August 1992. "I took this photo around summer of '93. I was in the military and jumping at St Mere Eglise DZ on Ft Bragg (NC). I was looking up the "N" number and came across your web page. I'm sending this pic because I thought you might enjoy seeing it. " During the conversion to turbine, Basler had also installed ferry tanks in the aircraft and its first deployment in 1993 saw it flying to Luqa, Malta although precisely where it went to next or what it did over the years that followed and when it returned to the United States also remain something of a mystery. The aircraft was re-registered N811RB to Stevens Express Leasing Inc in June 1998 and re-registered again to the same company as N845S in May 2000 and this remains its current registration today. (UPDATE- Reg'd 23Mar17 for Big Flats LLC, Durham,NC). The FAA file discloses that by October 2006 its total airframe flying hours had risen to 19,524. Given that when it left AUTEC service in 1976 with just over 7,000 hours, over the intervening 30 years it had an average utilisation of 420 hours per year. 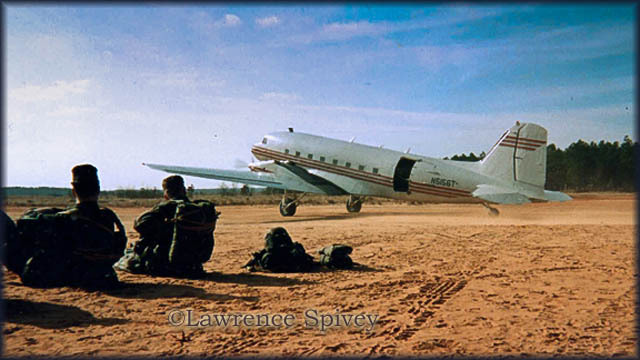 Whilst the writer has no personal knowledge of the accuracy or otherwise of what follows, the many newspaper reports and websites which interest themselves in such matters identify Stevens Express Leasing Inc, the registered owners of this C-47, as a CIA front company, and they may well be right. It is claimed that the CIA uses Stevens Express Leasing and several other companies to appear as the owners of aircraft, which are then used for covert activities. The address of the company is in Cordova, Tennessee which is a suburb of Memphis. Here is to be found a lawyer’s office, the address of which is that of Stevens Express Leasing. The company however has no employees, no business premises and no website. Instead, as one report describes it "the company has a CIA-contracted lawyer who provides a mail drop, registers the company with the state and the aircraft with the FAA and interfaces in other necessary ways with government agencies and the public". As well as the C-47, Stevens Express Leasing is also the registered owner of three Beech KingAirs and has an association with a Gulfstream 4. The press came calling to the lawyer’s office when Spanish investigators claimed that at least two of the company’s aircraft made stopovers on the island of Mallorca while engaged in "extra-ordinary rendition flights", which basically involve kidnapping people and transporting them to places where they don’t want to go, where they are allegedly tortured. The lawyer however was not talking to the press, saying that he could not possibly discuss his client’s confidential affairs. Media attention also focussed on another company, Aero Contractors Inc, of Smithfield, North Carolina. Unlike the already mentioned CIA front companies, Aero Contractors is a real company, with some 80 employees and a large hangar and offices at the Johnston County Airport. Aero Contractors, although it has no aircraft registered to it, operates and maintains the aircraft of Stevens Express Leasing and the other CIA front companies. As one report put it: "The airplanes operated by Aero Contractors take off from Johnston County Airport, then disappear over the scrub pines and fields of tobacco and sweet potatoes. Nothing about the sleepy Southern setting hints of foreign intrigue. Nothing gives away the fact that Aero’s pilots are the discreet bus drivers of the battle against terrorism, routinely sent on secret missions to Baghdad, Cairo, Tashkent and Kabul. While posing as a private charter outfit, Aero Contractors is in fact a major domestic hub of the CIA’s secret air service. The company was founded in 1979 by a legendary CIA officer and chief pilot for Air America, the Agency’s Vietnam-era air company and it appears to be controlled by the CIA according to former employees". 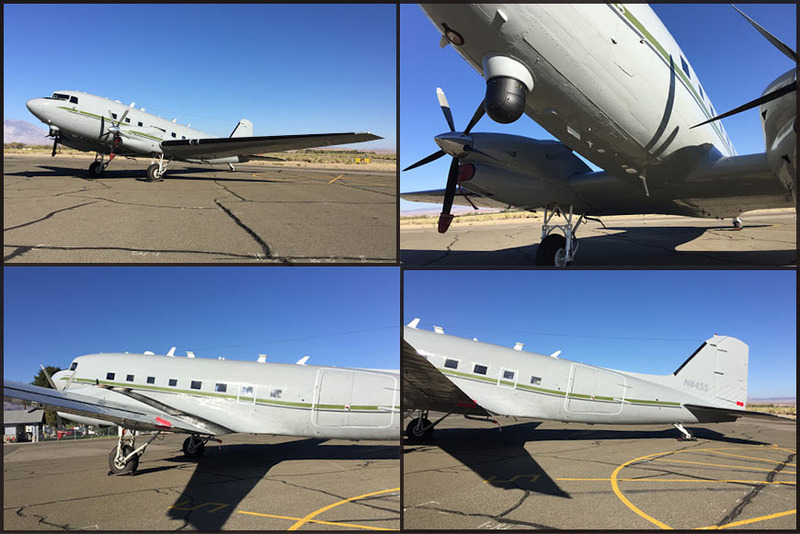 It is here with Aero Contractors at the Johnston County Airport, North Carolina that the Basler C-47 N845S is based, and where over the years it has received numerous upgrades to its navigation and communications equipment, ensuring it retains a state-of-the-art capability. Whatever about the other aircraft of Stevens Express Leasing (whose KingAirs do routinely visit some very unusual and out-of-the-way places in eastern Europe), it is not suggested in these various reports that N845S is engaged in these rendition flights and there have been no reports of it having visited Europe or the Middle East since these flights began around 2002. Although, as explained earlier, no information is forthcoming about the operation of this aircraft since it left AUTEC service up to 2002, it is more difficult nowdays to keep a secret, what with the proliferation of aviation websites. Since 2002 N845S has often been seen visiting Washington, DC, the centre of US government activity and has also been photographed in numerous locations around Mexico, Ecuador and Colombia, which suggests that its operational area is that of Central and South America. It is unfortunately not possible to track the progress of N845S on any of the flight tracking websites, as any attempt to do so produces the response – "not available for tracking at the request of the owner", a level of secrecy not usually sought by DC-3 operators. That, then, is the story to date of this C-47, as best it can be ascertained. There is still much to be discovered concerning its clandestine activities, but at least its history is now known and it is good to see this veteran transport still active in its 64th year. In Dec.2008 I received following in-flight sighting..
"For your information, I flew along side DC-3, N845S last Monday December 22nd. We caught up with them at intersection SEKAR just north of Dominican Republic. I was flying our aircraft at the time. They were at 16,000 feet and I was at 18,000 feet." "This is a very interesting article on BT-67 N845S, which adds c/n 25509 for N61696 when a C-47 and suggests that N68071 was used - 'ntu' per AB which also did not mention N6169H, applied for but n.t.u. - nor Aero Contractors base (as Smithfield, NC). The dates of Basler's conversion and delivery also differ, although all agree that it was supplied to Oshkosh as N21669. Basler quote delivery as 5.5.92 (as N21669) to Aero Contractors, which logically pre-dates the sale to Stevens Express Leasing (10Jul92) and re-reg'd as N5156T. I have an un-dated colour photo as such, showing a white top without titles, a three 'orange/red' stripes running from under the tail (with a black N5156T above, on the rear fuselage) to below the cockpit, the stripes repeated on the engine nacelles and fin. The location might be Oshkosh, but as it was registered as N5156T from Aug92 until Jun98 (when to N811RB and since as N845S) it could be anywhere. Does anyone have an early sighting under any registration with the (current) single purple stripe cheatline, shown on airliners.net at Washington DC in 2003 ? As for ownership, Basler's website continues to list the (delivery) customer and base as Aero Contractors, Smithfield, N.Carolina - 'for paratroop training' ! [ATDB lists Smithfield (Johnston County) as in VA, but assume latter incorrect as I have a 'CIA' article from 2005 which refers to this operator with their registered address in NC]"
[Sadly Lawrence Safir passed away, as can be read in Air-Britain's Aviation World, issue winter 2009. He responded to several aviation matters I struggled with and his name appears in the credits for several matters on my website. For Air-Britain he was a Specialist and offered help on many issues, esspecially on the DC-3. "Enjoyed reading the history of this beautiful old DC-3. I had the good fortune to be a passenger on this plane just before Christmas, must have been 1975. I was employed by RCA Service Company as an Electronics Technician at AUTEC on Andros Island. The FH-227 had gone off line waiting for parts and I was lucky enough to experience some aviation history traveling back to the states from Andros for Christmas vacation on the grand old bird. From what I recall, it was in good condition inside and out. I do recall the fuselage being white. The flight was smooth and unforgettable." "I stumbled across your site when I was looking for Hurricane Irene info. Was trying to find out if they’d evacuated AUTEC on Andros Island, and instead I got a nice trip down memory lane! I worked for Imperial Aviation at AUTEC in 1978 and 1981 as ground support and I have fond memories of the FH-227. I used to drive a fuel truck out to the airport to fuel the 227. It was one of the best parts of my job! Had to use a small step stool to get better leverage to attach the hose to the wing. Once a trainee took the pressure hose off before I’d shut it off, and sprayed me head to toe with jet fuel. Great story! I first flew to Andros in 1976 I think. I was 19 and it was also my first flight ever. My mother worked there and she arranged for me to ride back to the States in the jump seat the whole way from Andros to West Palm. I grinned for a week. I’m not familiar with the F-27, but I remember plenty of trips to WPB and Nassau looking out at those Rolls Royce turboprops on the 227. I believe she was white, with blue, and had AUTEC painted on it. Thanks again for the opportunity to relive some special times." "I loved your article about the mysterious DC-3 N845S, which I stumbled across this evening. More specifically it seemed to have 'appeared on radar' or 'took off' from the airfield near Camp Desert Rock and lingered north of Sugar Bunker and the whole area west of it, at about 13.000 feet or so. And it loitered around in dizzying flight patterns over and over again! It even appeared to have flown over the old testing area of the Nuclear weapons and from that height I wouldn't be surprised if they were able to see Area 51 / Groom Lake! Speaking of Groom Lake, during its flight in that area the plane was relatively close to a Janet 737 -flight out of Groom Lake. This all took place this evening (20Sep16) around 10pm Central. If you dig around on Flightradar24 you might be able to find some more. It really just deepens the mystery as to what this plane is doing, which adds to the fun!" Doug wrote me in Sep.2016 and added pics: "I came across your page while looking up N845S. It was (is) currently in Bishop,CA where I took the following pictures on 22SEP16."